One of my arguments for using compensation as opposed to springing of any sort has been the simple fact that weight distribution can be more easily controlled using the constant factor of gravity, rather than the variability of springs. 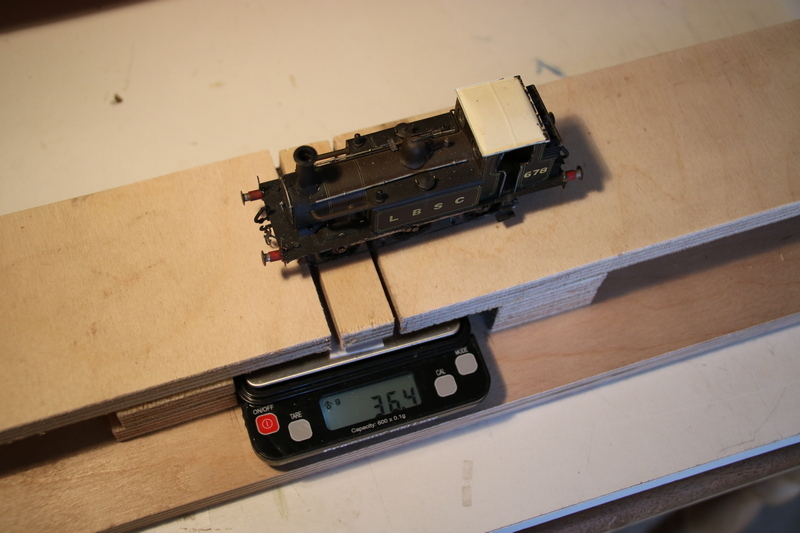 I have now (finally) built a mechanism which allows me to measure the actual axle loadings, and so to ensure that there is an appropriate proportion of loading on each axle, for road-holding purposes, and also for haulage purposes (of greater importance for four-coupled locos and singles). The device is fairly self-explanatory. 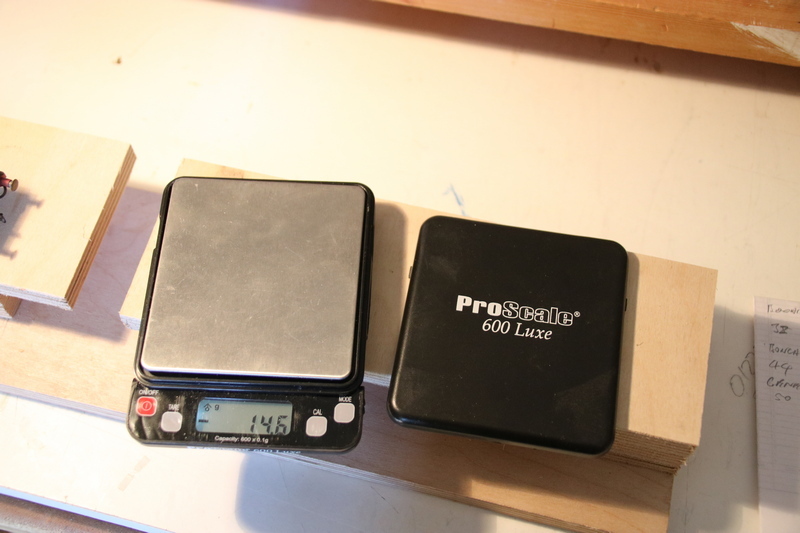 It is based on ‘PROSCALE’ miniature weighing scales, capable of measuring to 1/10th gram. The photo (right) shows the unit - rigid supports either side, with the scales underneath, and a small free-floating section in the middle, resting on the scales. The scales can be zeroed with this free-floating section in place, and then each axle in turn can be ‘weighed’. For some reason which I haven’t quite worked out, the ‘weight’ of each axle isn’t stable - it varies up and down by a few grams and never seems to settle on a specific reading before the scales time out and switch off (about 30 seconds). However, notwithstanding this, the measurements are accurate enough to check that the axle loadings are reasonably well balanced. 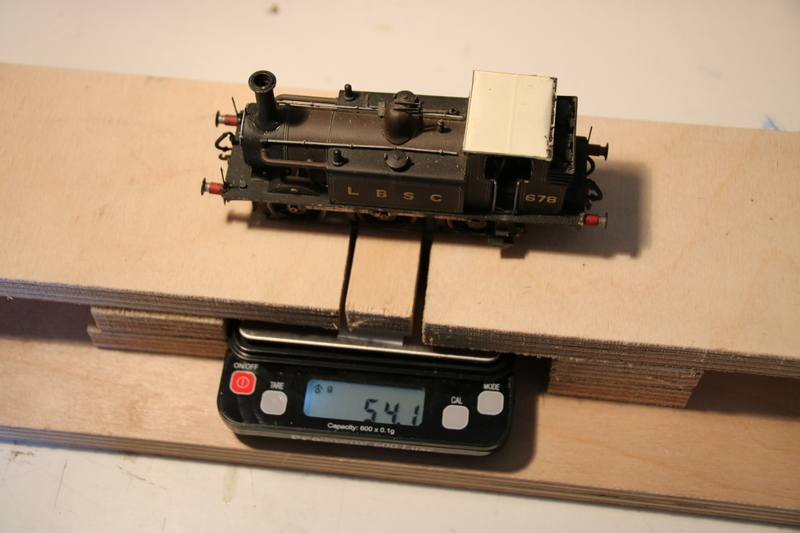 The tables below show axle loadings (grams) for all of my locos. All are fully compensated., apart from D1 297 which is a ‘pre-owned’ model with CSB’s. One might expect that the weight on the two axles with side-beam compensation would be the same, but of course one of them carries the additional weight of the motor and gearbox (or a proportion of it). 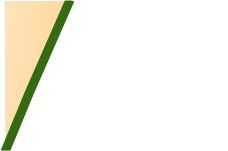 The bright green indicates which axle is the driven one, (always with side beam compensation, apart from the 0-4-0’s which have a rigid driven axle) and the paler green indicates the other axle with side-beam compensation. The third/fourth axle(s) have a centre pivot, or centre beam. The tender engines are all built with the motor/gearbox in the firebox, and the weighted tender hanging off the drawbar. The D’bar weight’ indicates the weight on the drawbar, adding to the overall weight of the loco. The leading wheels of the tenders float freely, held down by a small weight (hence the light axle loadings). There are some interesting conclusions to be drawn from these tables. All of these engines were built before I had the means to ‘weigh’ each axle, so it’s perhaps not surprising that some are not particularly well-balanced. The D3’s/E3/E4’s/E5/E6 all look reasonably evenly balanced. The E1’s similarly look ok, although 86 and 109 could perhaps be slightly heavier at the front. E1 no 135 is a white-metal body which explains its weight. The D1’s look slightly more variable, but ok, although 297 could perhaps do with more weight on the leading axle whilst 234 seems to have an unnecessary amount of lead in the bunker. A1X 678 is well-balanced, but the A1 Boxhill 2-4-0 looks a bit light on the leading axle, which may explain why it sometimes ends up in the ballast at speed. I found this slightly surprising since it is a heavy white metal body. It can be explained by the fact that the side-beam pivot is mid-way between the driving wheels, and hence quite a lot of weight (the bunker and cab) is aft of this. A simple consideration of the principles of levers shows that whilst this weight will add to the weight on the drivers, it reduces the weight on the leading axle - just like a see-saw. A bit of added lead in the boiler/smokebox will fix this problem. The I3 is the heaviest of all the engines, and is as steady as a rock, but perhaps doesn’t need quite so much weight in the bunker. The B4 has an occasional habit of jumping the rails at speed, which may be caused by the relative lack of weight on the bogie axles. I have added more weight to the front of the loco, and this seems to have fixed the problem - it now runs end-to-end of the layout at top speed without derailing. The C2 is fine, but has a tendency to derail when running in reverse over the downmain-to-yard crossover (and nowhere else). Nothing else falls off here so it appears to be a particular combination of loco and trackwork. 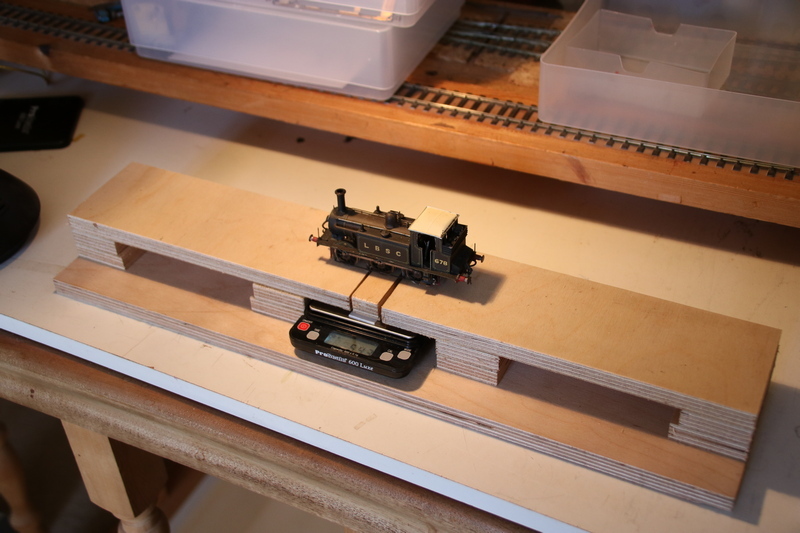 In separating the loco and tender to weigh them, I have managed to break the draw-bar. In trying to mend the draw-bar I have broken one of the frame spacers, and in trying to re-attach the frame spacer, the rocking pivot on the rear axle has come apart. The loco was built in 1987 so perhaps I shouldn’t be surprised. 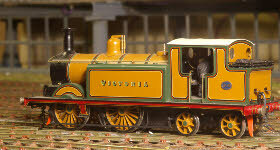 However, in re-attaching all the various broken bits, I seem to have fixed whatever caused the derailment! Having eventually restored the loco to running condition, I have been able to check the axle loadings, and it looks remarkably evenly loaded (table above). The D2 runs well but appears to lack tractive weight, being the second lightest four-coupled engine after D1 297. That just leaves the G which has a fairly impressive 93g on its driving wheels, but still can’t pull very much. All of this begs the question of how much does a loco need to weigh - as heavy as possible, or is there a downside to a heavy loco? A haulage test using seven of my heaviest coaches (the longest train we can assemble on Pulborough) reveals that nearly all the engines can pull this train without slipping, including the 2-4-0 Terrier (126g tractive weight) and D1 297 (103g). Even the industrial tanks with a mere 80g or so on the driving wheels can pull four of these carriages. The exceptions are the D2 (0-4-2) and the G (2-2-2) with tractive weights of 118 and 93 g respectively. Interestingly, the D2 without its tender can pull all seven carriages, although with the tender attached can only pull six without slipping. This rather suggests that the tender is more of a liability than anything else. I have a added a bit of extra weight to the front of the loco, and removed some from the tender in an effort to make it more free-running., and to take some weight off the drawbar. I have added little bits of lead in various places on the G, including direct loading of the gearbox - increasing the tractive weight from 93g to a very surprising 125g. I still have to sort out the tender which derails running in reverse. I think is partly a problem with a wobbly wheel, and partly too little weight and too much sideplay on the leading axle. The G can now pull six of the balloon coaches, provided it accelerates slowly. The tables below show the improvements I have been able to make.